Having covered the basics in the bestsellers “Aikido: Foundations” and “Aikido: Practice & Purpose”, this DVD guides you to the next level, expanding your repertoire with dynamic techniques. 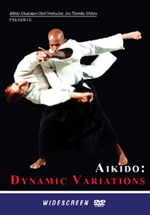 The DVD includes a series of ten techniques, demonstrated from five different aspects and enables you to practice and explore variation within aikido. Through the practice of techniques from different perspectives, one can understand better the intricacies and subtleties leading to excellence. In addition, it shows you that aikido is an art form which is constantly evolving and allows the practitioner to refine and adapt accordingly. All techniques are demonstrated at a slow and fast pace, making it easy to study. In addition, the menu format allows the viewer to replay a technique or move on to the next technique, suiting individual needs. This DVD is a fantastic resource and reference not only for aikidoists but any martial artists looking to widen their skills and broaden their knowledge.